It’s pretty obvious to anyone that knows LP and I that she is my mini-me. She looks like me when I was her age – and looks pretty much like me at the moment too. She’s fair skinned, ginger and so petite. But, one similarity that is growing year on year is our freckles. I have had freckles since I was tiny and I remember them growing and multiplying in my teens, where any of my skin that was sun exposed would get littered with freckles, a few more appearing each year. LP got her first freckles last year, just a couple on her nose and one on the back of her neck. But when the sun came out this summer a few more appeared, a couple more on her nose, one by her top lip and a couple on her cheeks. But, being on holiday for the last couple of weeks those freckles have come out with a vengeance. They have multiplied and spread and now her whole nose is covered in them. She has them spreading from one ear to the other, down to her mouth and even a couple on her forehead. The back of her neck is speckled with them and she has little solitary ones on her arms and legs. 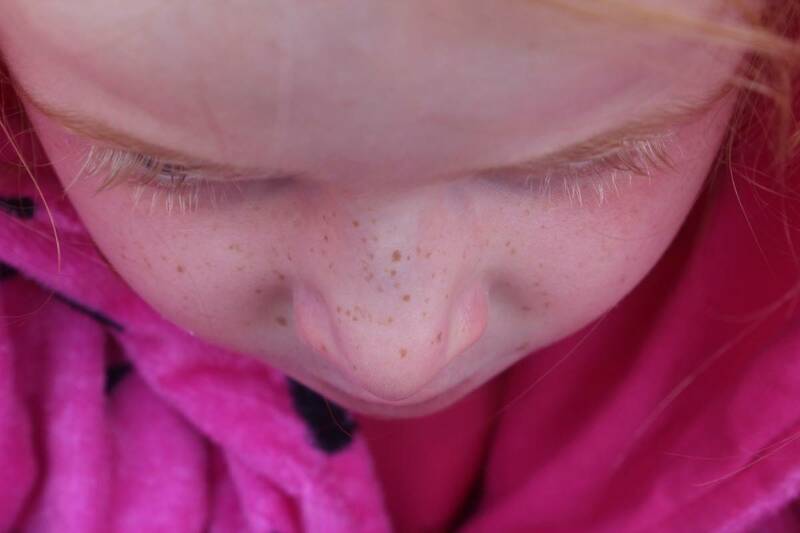 And although we cover her in factor 50 sun cream, and put a sun hat on her every day, those freckles are something that I know will fight until they’re seen. It’s in her genes. LP has never been sunburnt. Her skin is as protected as possible from the sun and yet those freckles still pop up, as if they just can’t wait to be seen. And I know that in 25 years time, when she’s the same age as me, she’ll have skin that is awash with freckles, that she’ll not be able to tell the skin from the freckles and that she’ll stop remembering which were old freckles and which are new. But for now I remember LP’s face before the freckles, when there wasn’t a mark or blemish on her, and I remember when they started appearing and which ones came out each day. I know that when winter comes her newly freckled face will be etched on my memory so next year I’ll know which freckles are new again as I watch her face growing and changing before my eyes. Freckles are something so familiar to me, they are as much a part of me as being ginger but on LP they are still so new, they go with red hair like peas and carrots and yet on LP they change her face yet again. But they also show another year, another summer of fun and adventures. I cannot wait to see how many freckles a lifetime of adventures will bring to our little LP. If you have an ordinary moment this week, come and link up with myself and Katie – we love reading your posts each week and I’m looking forward to getting back into the swing of reading and commenting on them all now I’m back from holiday! I’m covered in freckles too and Cheeky Chap has started to get them over the last couple of years.